Update on the status of the Park Renovation as of May 22, 2014. The contractors are a bit ahead of schedule right now! Right now the end date for construction still stands at mid-September. However, we are optimistic about finishing earlier. Once the new paths have been poured and installed we will be able to give a more accurate date for a grand re-opening. 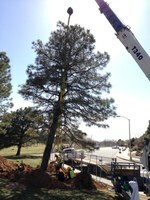 In March, two enormous trees were saved and moved to make way for the new walking/jogging paths. The trees are being monitored closely and given extra water. They are braced with strong cables which will remain in place until new roots are firmly established. After the trees were moved, a concrete retaining wall was built to create a flat area for the paths along Admiral Emerson Avenue. First, anything requiring the use of heavy machinery will be installed – the new sculpture, for example, and the shade structures at the playground. This is to prevent damage to the new paths. Simultaneously with this work, areas that will receive new xeric plantings are being prepared. An area near the school has already been planted. The south end of the park near Layton has been graded and prepared for slope stabilization and an extensive xeric planting area. Irrigation equipment for the park is located here. When all the heavy construction is completed, we will be installing new benches and picnic tables.